I know its been too long since I’ve posted but I’ve been side tracked with travel and work but still managing to get out there and eat! So, I’m back and I hope you’re ready to read what I’ve been up to. 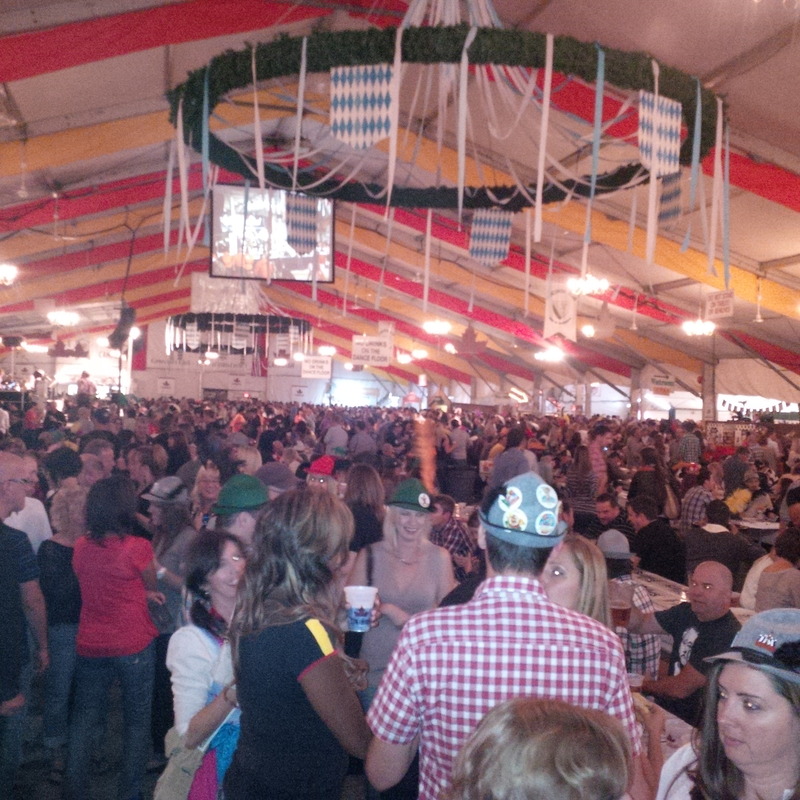 My most recent outing was to Kitchener-Waterloo for Oktoberfest. Yes, this festival originates in Munich, Germany but Kitchener-Waterloo has been celebrating since 1969 and they sure know how to throw a party! This is the second largest Oktoberfest in the world. 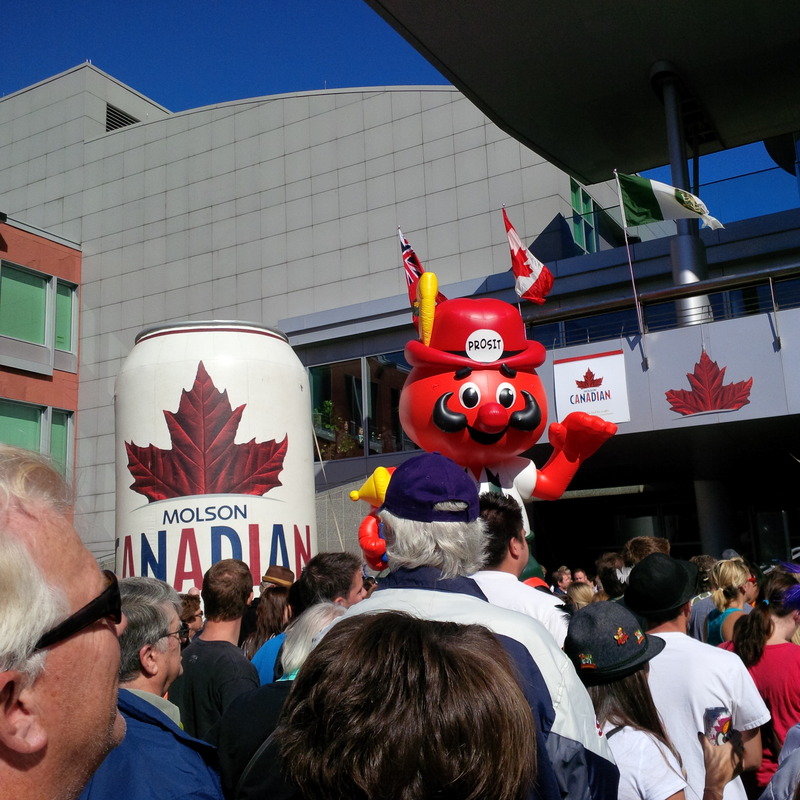 I attended the opening ceremonies where they tap the ceremonial keg to launch the beginning of this 10 day festival. 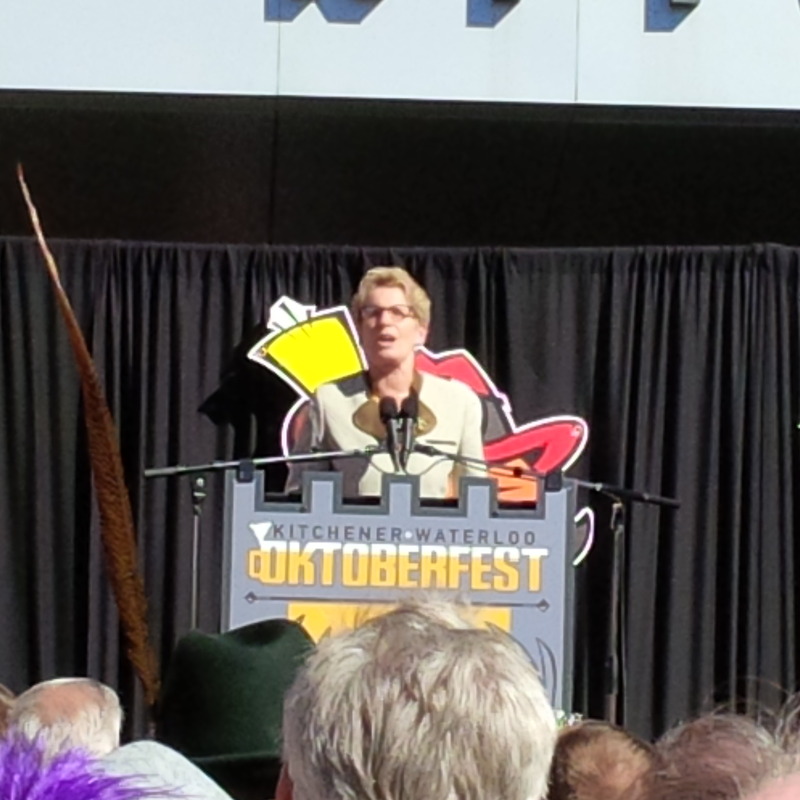 Kathleen Wynne, Premier of Ontario, was on hand to help open the keg and even greeted the crowd in German. 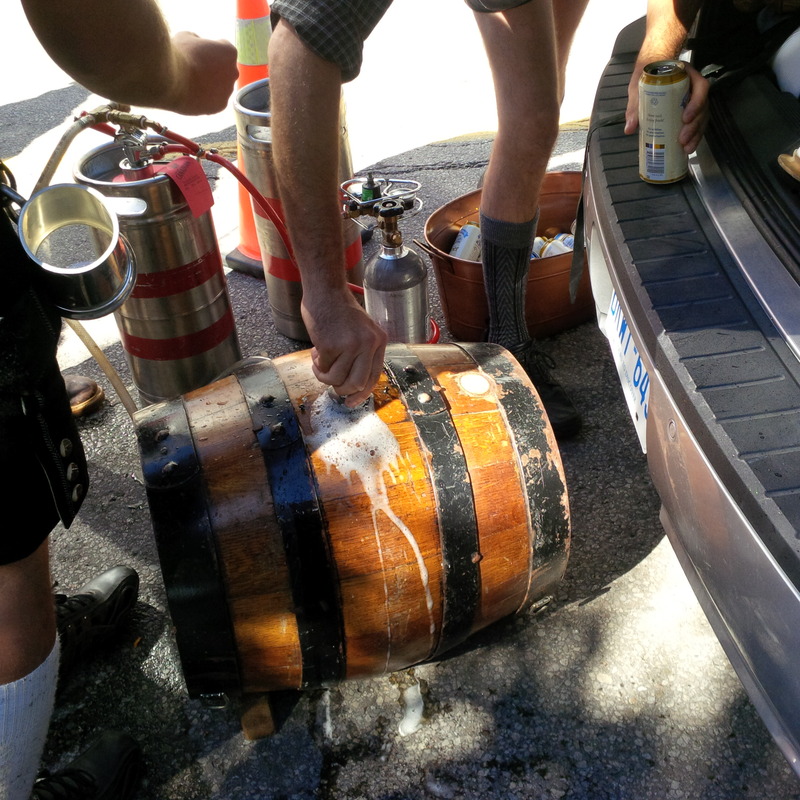 I managed to get an up close peek at the keg before it was on stage. Its a four man job to get that baby prepped and to be careful of spillage. But lets get to the evening portion. My group of friends went to the Concordia Club as they are known to have a great party. We started at the Shenke Restaurant to have traditional Bavarian food. If you eat one thing, you must have an Oktoberfest sausage. I ate two that day because I couldn’t resist them. It’s traditionally served with a ton of sauerkraut but ketchup and mustard is also available. I’d be curious to know how many they sell in a 10 day period. 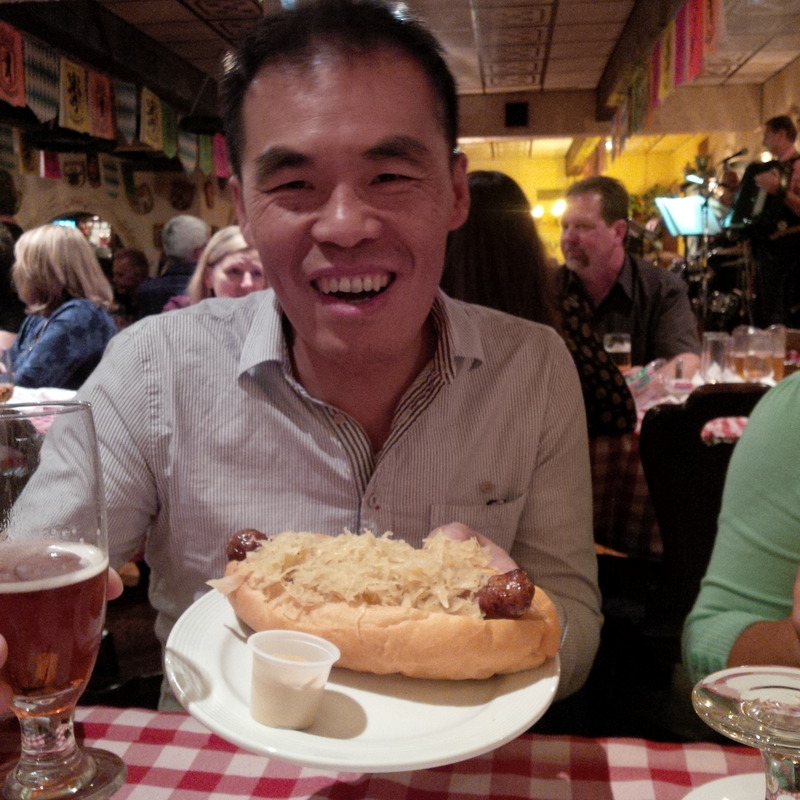 Sausage with lots of sauerkraut held (and eaten) by my friend Ken. 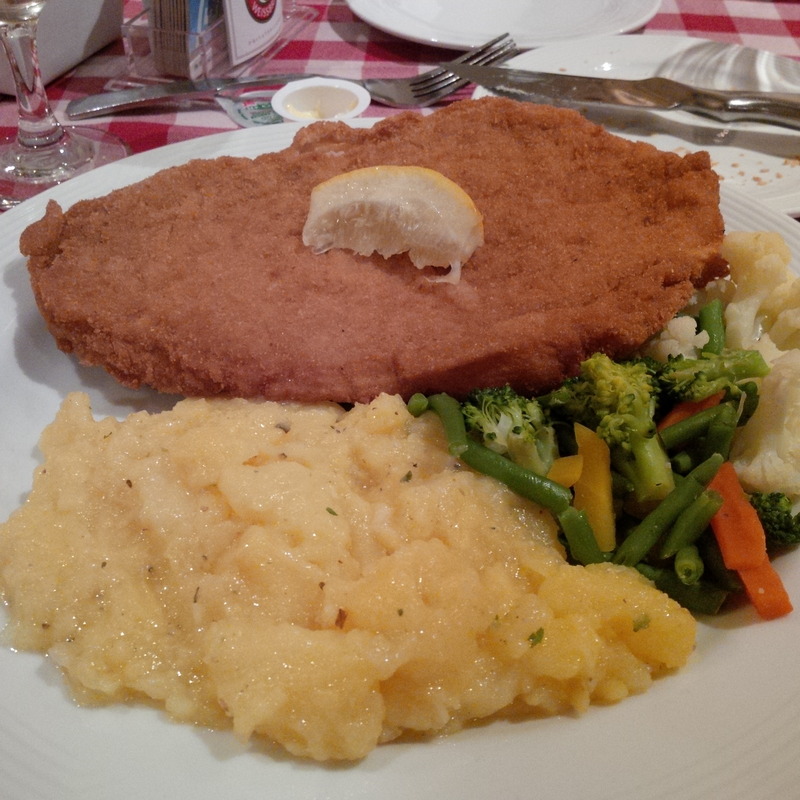 For dinner, I had the schnitzel.They gave me quite a large portion and I did not complain. Wiener Schnitzel: Breaded pork schnitzel with German style potato salad and vegetables. I have to say that I love this potato salad! It’s tasty and for the lactose intolerant like myself, it has no dairy! Why haven’t I had this before? Instead of using mayonnaise, you use a mixture of oil, vinegar, onions and some chicken or vegetable stock to hold it together. It’s delicious. 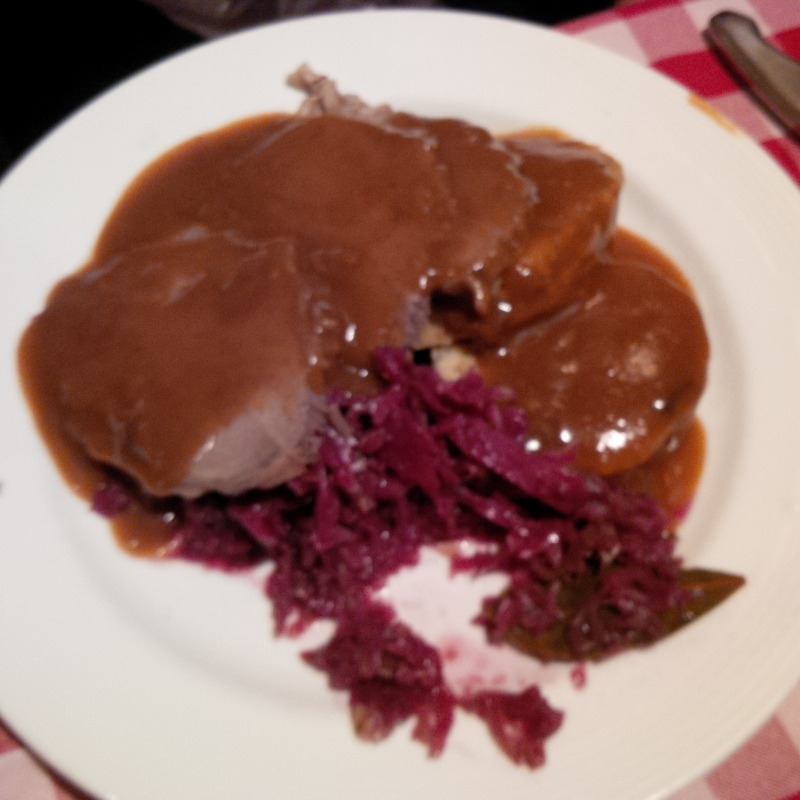 The other popular dish to have is German Sauerbraten. You can’t see the dumpling as it’s covered in gravy this this is also quite a filling dish with tender beef. If you can get up after you’ve eaten, then you head to the beer tent. The tent at Concordia can hold up to 4000 people. This is not a joke and here is the best picture I could take to understand the size. There are many bars set up inside where you can get a pint or a pitcher of beer, schnapps, and wine. The main stage had a band with a real yodeler, dancers – even drunk ones. There are also a ton of activities you can participate in like: the dunk tank, try to hammer a nail in wood in one shot, shooting – yes I said shooting but obviously not with a real gun. I’m sure you notice that there are no pictures of these things because I was too busy having a great time! If you’ve never experienced Oktoberfest, you should at least once. It was a fun time! I think for most people, the heavy helps you make it through a night of heavy drinking! LOL.